When’s the last time you found yourself in a situation where a prospect would not make a decision? You’ve dotted every i, crossed every t and even jumped through a few extra hoops and still gotten nowhere. Most of us have found ourselves in this situation a time or two. We start to wonder where we went wrong, maybe we even start to resent the prospect a little too. There’s nothing worse than feeling like you’ve done everything in your power to give someone what they’ve said they want only to have them not make a decision. One of my VIP clients found herself in this very situation recently. The lengths she’d gone to in order to earn someone’s business is what most of us would describe as “above and beyond”. 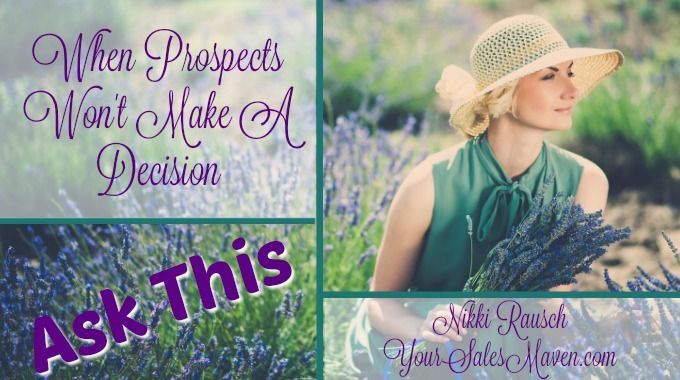 The prospect was thrilled to take her calls, meet with her, accept every resource she’d offered and still no sale. During one of our sessions, I asked her to tell me what it was about this prospect that kept her coming back again and again to earn the business. She has valid reasons and was committed to earning the business. One of the first questions I asked her was had she ever in fact actually asked for the business. Had the words actually left her mouth? It’s not uncommon when people tell me they’ve done everything they can to earn someone’s business to actually uncover that they never, in fact, actually asked for the business. This is why I consistently teach people how to invite others to do business with them. In the case of my VIP client, she assured me she’d issued invitations on multiple occasions and never felt like she received a concrete answer from her prospect. The prospect hadn’t ever said no, yet still hadn’t given her the business. When this happens, it’s time to ask a more direct question of the prospect. She called later in the day to let me know that not only did she ask the question, “What will it take to earn your business?” she actually received an answer from the client. Once she had a concrete answer of what it really would take, she was able to stop spending time and resources on things that even though the prospect accepted, weren’t helping to earn the business. In the selling process, it’s easy to assume that what works for one client, will work for all clients. Unfortunately, that’s not always the case. Spending time and resources doesn’t guarantee someone’s going to give you their business. Uncovering from each client what’s needed in order earn their business is 100% your responsibility.